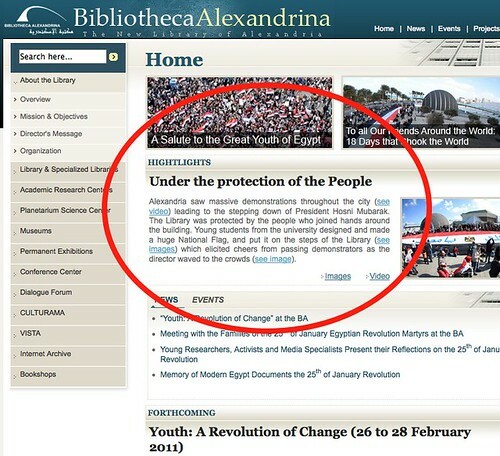 The citizen uprising in Egypt, which would have some significance to librarians because that's where the Bibliotheca Alexandrina is located (non-librarians might be more familiar with the ancient Library of Alexandria). What's hearterning was that citizens stepped up to defend the library against vandals and looters. News of the protests in Egypt started unfolding in late Jan. The world has witnessed an unprecedented popular action in the streets of Egypt. Led by Egypt’s youth, with their justified demands for more freedom, more democracy, lower prices for necessities and more employment opportunities. These youths demanded immediate and far-reaching changes. This was met by violent conflicts with the police, who were routed. The army was called in and was welcomed by the demonstrators, but initially their presence was more symbolic than active. Events deteriorated as lawless bands of thugs, and maybe agents provocateurs, appeared and looting began. The young people organized themselves into groups that directed traffic, protected neighborhoods and guarded public buildings of value such as the Egyptian Museum and the Library of Alexandria. They are collaborating with the army. This makeshift arrangement is in place until full public order returns. The director of the Bibliotheca Alexandrina has announced that his building, built in commemoration of the famous ancient library destroyed in antiquity, is being kept safe by Egypt's young people during the current unrest sweeping the country. ... "The young people organised themselves into groups that directed traffic, protected neighborhoods and guarded public buildings of value such as the Egyptian Museum and the Library of Alexandria," he states. "They are collaborating with the army. This makeshift arrangement is in place until full public order returns." This week on 22 Feb, over in New Zealand, news of the Christchurch Earthquake caught the world's attention. I first learned about it from a Facebook friend's status update, where he posted a link to the Australian Broadcasting Corporation news page. I was quite stunned by the video footage. The New Zealand Library Association's (LIANZA) blog posted updates of news about their library colleagues affected in the quake. At this stage I think we need to accept that with limited phone and power facilities, those on the ground in Christchurch are focusing on their immediate needs and those of their family and neighbours. The practicality of this is that people will be conserving battery power on their phones and computer for emergency use and I don’t think we can expect to get any detailed reports for some time. As of 24 Feb, the LIANZA blog post reports that "all library staff in the Christchurch area were safe, although many are contending with personal property damage. There is no information about many of the libraries which are still closed." I'm not a religious person. But I'll say a prayer for librarians and people in Christchurch.